creations whose invisible energies are played with a wave of the hand. 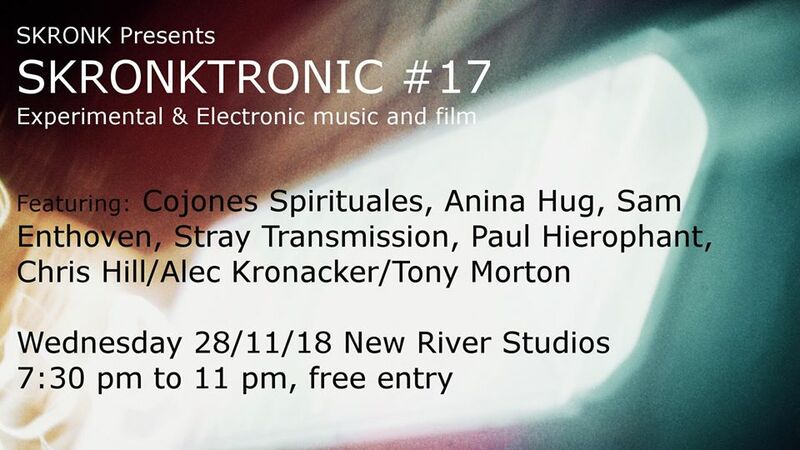 Stray Transmission: Stray Transmission’s dynamic and immersive techno emerged from live performances on London’s electronic and experimental music scene. Early performances of techno channelled through field recordings, beats, hybrid set-ups and improvisation evolved into live hardware-based sets. Stray Transmission is the techno alias of London-based musician and sound artist Nazar Ali Khan. Alongside live performances, digital releases, remixes and DJ sets, Nazar has also performed in collaboration with raxil4 and the Cult of Rammellzee, and has toured extensively around the UK with Inner City Unit. Sam Enthoven: Theremin and electronics based performer, Sam plays in many different contexts, always surprising. Hill/Kronacker/Morton: improvising trio, no idea what it will be like.